Our Products >> Zodiac Cadet 340 NEO R.I.B. The Zodiac Cadet 340 RIB NEO rigid hull inflatable boat is the largest Hypalon open rigid hulled inflatable in the Zodiac tender line up. 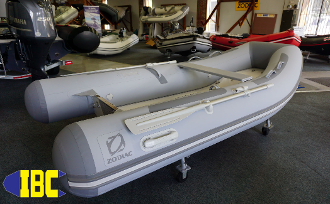 The Zodiac Cadet 340 RIB NEO rigid hull inflatable boat is a very versatile boat offering the ability to leave it as a skiff, or add seats and steering making for a lightweight good performing dinghy. With plenty of room, carrying capacity, and horsepower rating this boat will meet the needs of demanding cruisers and general boaters alike. With it's heavily built transom and higher horsepower rating this boat will really surprise those looking for a good performance. Zodiac Cadet 340 NEO R.I.B.